Another practice puzzle for the Keller round. This one has a wart, I messed up the sign on the break-in, and don’t see a nice way to fix it. This will have to do. I don’t remember whether it’s actually difficult, beyond the awkwardness of the type. EDIT: Fixed an ambiguity, thanks uvo. Rules The left grid is a Sternenhimmel. Place some stars in empty cells, such that every arrow points at at least one star, and such that every star is pointed at by at least one arrow. 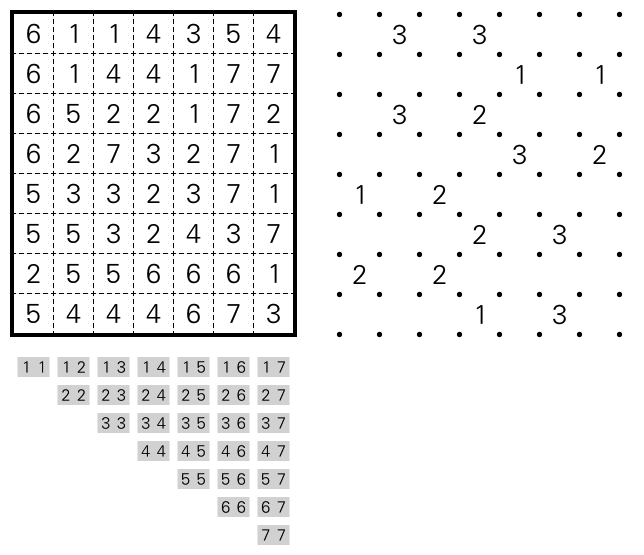 Clues outside the grid indicate the number of stars in the row or column. The right grid is a Magnets grid. 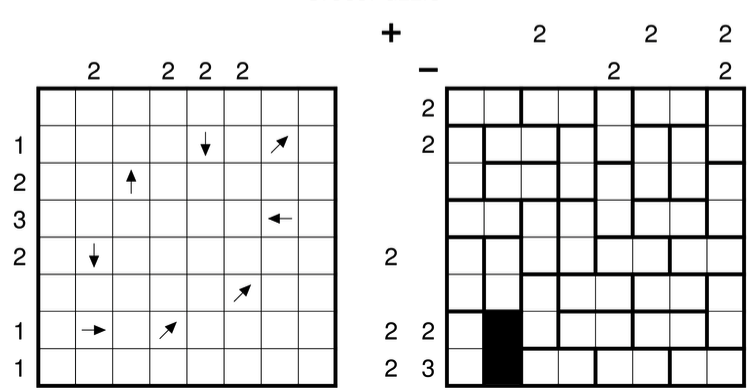 Place + and – in some cells, such that every 2×1-plate is either completely empty/shaded (neutral), or has one + and one – (charged). Same signs can’t be adjacent. The grids interact: Stars may only be placed over charged plates. Arrows over charged cells are rotated (90˚ clockwise for +, counterclockwise for -). This entry was posted in Puzzles and tagged hybrid, keller, magnets, medium, sternenhimmel on 2016-06-20 by rob.